Submitted by Adrian Brown on Wednesday, May 16, 2018 - 22:46. 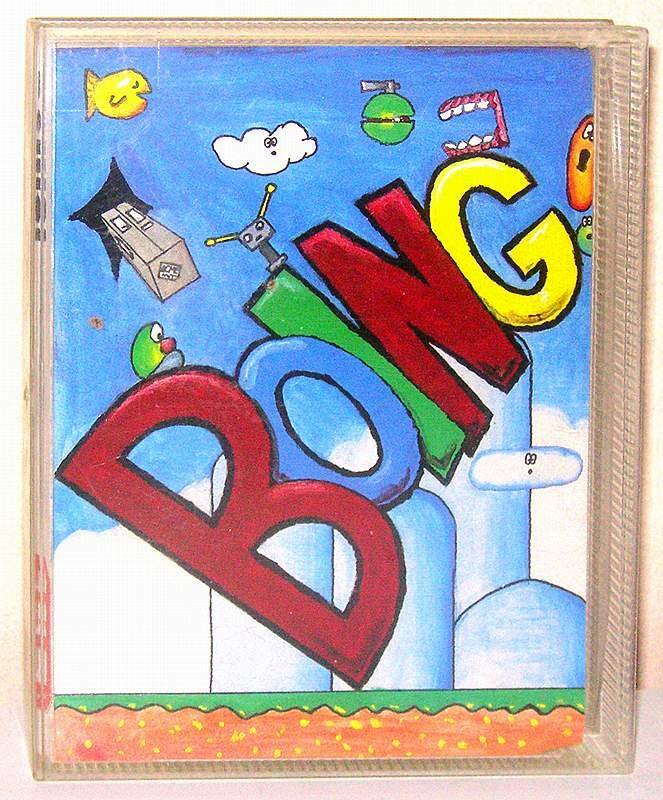 Boing's time machine has crashed on a strange land and only by collecting 20 Potions, the Crystal, the Battery and the all-important lever will he ever get the time machine working again. Right! Hands up who thinks that Dizzy was (and still is) one of the most inspiring and brilliant character around? He had style, grace and personality. And yet, he was a bouncing egg with boxing gloves. But we love him, don't we, readers? Apart from the people who despise him appearing for the seventh time on the small screen. Now let's take the SAM version of a new hero... A green blob. Collect three pieces of a time machine and 20 potions, then find the exit and escape from the crazy planet infested with nasties of varying weirdness. We've seen it all before, eh? But this game is of an incredibly fun calibre in terms of playability. You control this blob (no name!) through a flip screen environment of well animated nasties bouncing on a set course. You have to pick up objects and use them on certain screens to achieve certain results. Aha! Just like Dizzy! The only real difference is the energy bar which is used instead of an "instant death" situation from the Dizzy games. This bar can also be refilled to it's peak by hearts. The game reloads every time you die, which is very frustrating and seems completely unnecessary to fuel the front end demo (which gets boring after a while, even though there is an impressive border scroll which I don't know how they did!). There seems to be a definite Dizzy influence, but there is a very small amount to do in the way of objects. Most of the game involves running from one end of the game to the other. It's too easy. Experienced gamesplayers like myself will finish this very soon - I finished it on my 4th go. As a game for the younger inexperienced player, it is a great purchase for them. The energy bar is fair enough for a younger player, but this is it. I feel that Boing! is not the instant classic that the programmers probably hoped for. The challenge seems large, but you end up finding it too easy. A first go score is 1 piece of the Time Machine and 12 potions. Also, the objects are too easy to find and use on screens. 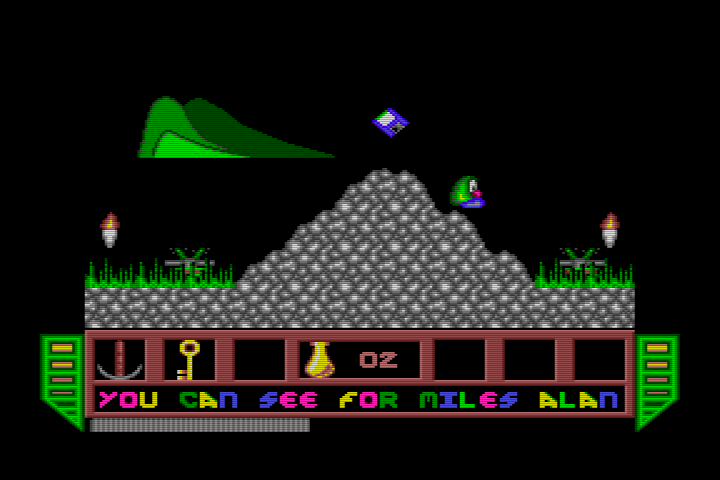 Younger players will find object placing hard, but the titles of the screen actually give the game away. 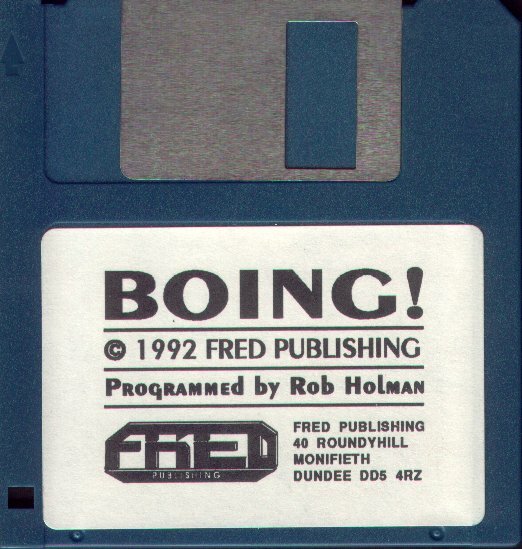 So, Boing! is a good but not good enough attempt at a fulfilling game. As a collecting adventure, many experienced players may be disappointed, but it is worth a look anyway. It's a hard life when you're a sentient slime mould with a very big nose. Boing! is a funny old mix of the rather spanky and the downright horrid. On the downright horrid side there's the fact that instead of lives you've got an energy bar which takes the edge off bumping into the nasties and encourages mad acts of recklessness. Sneakily, it's still possible to die outright by falling too far or tumbling onto some spikes, which seems a bit harsh on the clog-footed amongst us. Also, the graphics are a bit of a mixed bag - the backgrounds and some of the sprites are really fun and characterful, while others (like the gnashing teeth) are just plain badly-drawn. (And Boing himself is about as interesting as you can reasonably expect any sentient slime mould with a very big nose to be. Leafing over to the rather spanky paragraph (ah, we're here already) we've got the exact collision detection, the not-terribly-hard-but-warmly-rewarding-when-you-crack-'em puzzles, and the timing-sometimes-approaching-Manic Miner-levels-of-deviousness jumps you have to do in order to beat the nasties. I mean, on the Voltaire Hyphenated Sentence Scale alone, it's got to be worth beaucoup points. But before I go into the kitchen. I'll give the traditional final analysis. Boing! is a very enjoyable, frightfully professional and excitingly commercial platform game. The most annoying thing about it is the one-life energy system. But it's endurable. I don't think Boing is going to become the Coupe mascot, but he's got a game he can hang above his mantelpiece and talk about over dinner with swell-chested pride. 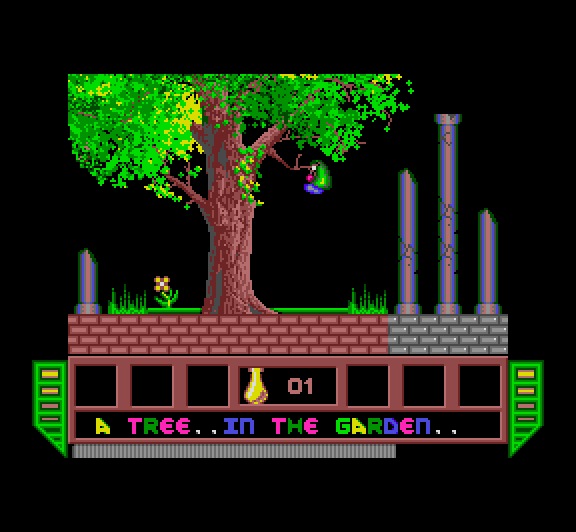 Cheat mode: Jump behind the tree at "A tree.. in the garden.." to collect the torch. Go left to "A bridge..to nowhere?" and jump up and down between the fish several times. You will fall through the bridge. Now drop the torch (important!) and use either teleporter. You can now touch creatures without losing energy.